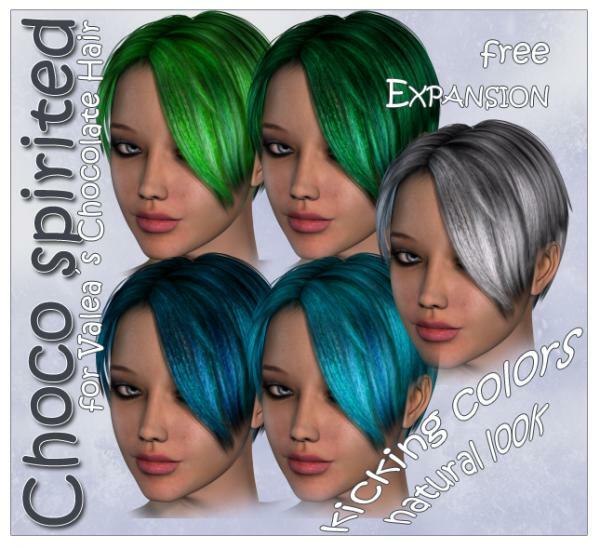 This is a complete package of five new textures for Valea�s Chocolate Hair, available at DAZ3d. It contains 5 textures for the hair, 5 textures for the skullcap, 5 mat-files to apply the colors to the whole hair, 5 mat-files for the hi-lites, 5 for the bangs, 5 for the wisps and 5 mat-files for the base. PsychaDurmont (11 years ago) Inappropriate? Thank you very much for these! Very beautiful!